best rate surveillance camera i bought it form your store,working so great until now,nothing worng happen yet,i would like to buy another one. 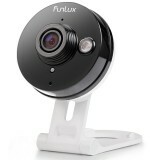 It’s an excellent IP cam that I have used for the past year. It gives me peace of mind when I'm not at home. I can still see what is going on through the Internet on my iPhone. I bought this wirless nvr system for my family for Christmas. Was a little skeptical after reading the reviews but took a chance anyway. It was much easier than I had expected. I am also very satisfied with the cameras as well. I do plan on adding more cameras soon. Easy to set-up, with wireless capability less wires to drill holes through the wall for. A hole for the power cable from each camera is all you need. The recorder picks up the signal and records up to nine months then re-starts recording. You can save events on a thumbdrive to show law enforcement in the event you need evidence of a crime. At night, the wireless cameras have a red glow, evidence of their infra-red ability. IP security cameras, or as they are also known, Network Cameras, use digital rather than analog camera technology. Analog video surveillance cameras require a video power cable, whereas IP Cameras utilize one Cat5 cable to both send the video and provide the IP camera with power. The IP Network Cameras are then plugged into a switch or router like a computer. Our store offers a few kinds of wireless surveillance cameras that are the current evolution of security cameras, there are many benefits exist to using a wireless video surveillance system. With this WiFi security camera, you don't need to run wires from the cameras location back to your TV, monitor or recording device, which makes wireless CCTV systems great for existing homes or businesses that do not want exposed wires or concealing the wires would be difficult. Why the latest wireless CCTV system becomes more and more popular among customers today? The reason is that a wireless video camera comes with a few benefits to the user. Here are two main characteristics of IP wireless cameras that attract you to buy one for your security needs. Because they are wireless, these wireless CCTV packages take the flexibility to be located from anywhere you want to, and move around within the network. Moreover, you can watch videos from the cameras via your Smartphone or any computer on the network.